You need to be at the Creative Industry Summit, Nov. 12-13! Kentucky artists and creative people who make all or part of their living from selling their work are the backbone of the Kentucky creative industry. Yet, many Kentucky artists don’t think of themselves as small business operators or entrepreneurs, which can create disconnect between artists and valuable resource providers when artists seek business development assistance. Click to see this graph at actual size. The Kentucky Creative Industry Report, released by the Kentucky Arts Council in December 2014, included important data about the Commonwealth’s creative workforce that has provided new opportunities for the arts council to address some of these issues. As part of the study, we conducted a survey of Kentucky artists and creative freelancers. 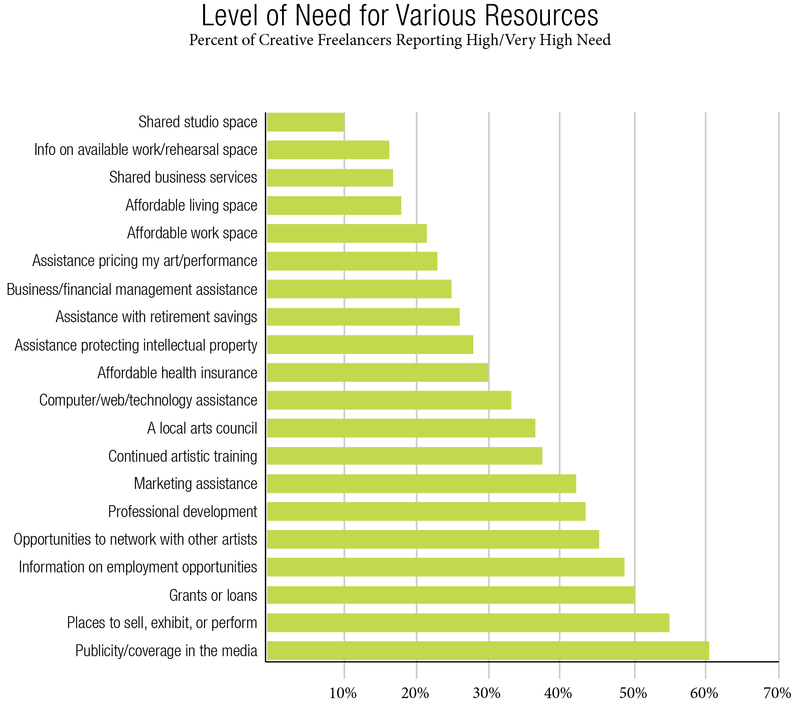 That survey gave us an overview of the needs of those who work in the creative industry. It helped us set goals and identify new avenues of assistance to better meet the needs of the state’s creative workforce. While the survey details specific needs, when looking at the list overall (which you can find on Page 18 of the report or in the graphic to the left) many of those needs fall under one category – business training and development. We’ve addressed this in many ways this year, providing opportunities to artists and creative entrepreneurs to gain valuable skills that will help them grow their arts businesses. The arts council is offering another great opportunity for artists to receive business training, generate ideas for growth, learn how to market and promote their work, and get in on a discussion about how to become arts leaders in their own communities through team-building. Our one-day workshop for artists and creative entrepreneurs at the Creative Industry Summit Workshops on Nov. 12 will cover all of these topics and give artists a chance to network among their peers. The workshop is $10 and features excellent speakers and workshop presenters. Check out the agenda online and register today. Have questions or need more information? Contact me at emilyb.moses@ky.gov. Please share this exciting learning opportunity with your own networks of Kentucky artists. By doing so, you’ll be helping the arts council in its mission to strengthen and grow the state’s creative industry.